Perhaps you have seen the research that Cisco IBSG has shared about the Internet of Everything phenomenon. Others are now participating in the global market assessment, with the intent to gain a better understanding of the applications and associated upside potential. The latest data from ABI Research on the Internet of Everything (IoE) shows that there are more than 10 billion wireless connected devices in the market today -- with over 30 billion devices expected by 2020. "The emergence of standardized ultra-low power wireless technologies is one of the main enablers of the IoE, with semiconductor vendors and standards bodies at the forefront of the market push, helping to bring the IoE into reality," said Peter Cooney, practice director at ABI Research. 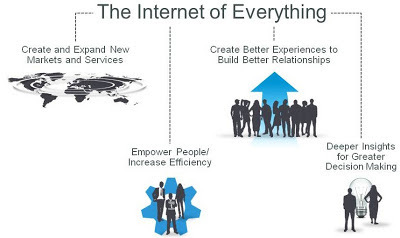 The year 2013 is seen by many as the year of the Internet of Everything, but it will still be many years until it reaches its full potential. ABI believes that the next five years will be pivotal in its growth and establishment as a tangible concept in the global marketplace. Bluetooth, Wi-Fi, ZigBee, Cellular, RFID, and many other wireless technologies are all important to drive growth within the Internet of Everything. The long term expansion of the market will be dependent on wireless technology becoming invisible so that the consumer will be oblivious to which technology is used and only know that it works. "Today, Hub devices such as smartphones, tablets, and laptops are pivotal in enabling the IoE ecosystem and will continue to be an essential building block," added Cooney. Future growth, however, is driven by node or sensor type devices and by 2020 these will account for 60 percent of the total installed base of devices. These latest findings are part of the new ABI Research Internet of Everything research service, which includes market data, and insights.